For strength and flexibility of your back and spine. 1. Sit with legs together, feet touching. Let your hands rest on your thighs. Spine straight. 2. Gracefully, raise your arms slowly to shoulder level, then bring them over head. 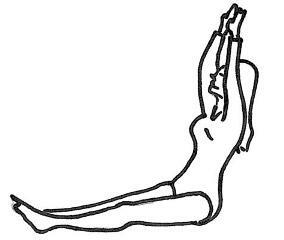 Bend backward several inches to firm the abdomen. 3. Slowly, gracefully, bend forward. Keep arms outstretched. 4. Hold knees; do not go further than knees. Do not bend knees. Relax your neck, bend head forward. 5. Hold knees firmly and draw upper body down as far as possible. Aim head towards knees. Important: bend elbows outward. Feel spine stretching but do not strain. Hold the posture for 20 counts without moving. Slowly straighten to upright position of Figure 1. Slide hands back to knees. To proceed to the next exercise.to remove tension from your back and spine, click here.